You can enjoy a dog friendly day out at Chiltern Open Air Museum. The 45 acre site has lots of space and woodlands to explore as well as over 30 historic buildings that have been rescued and reconstructed on the Museum site. There are dog drinking bowls outside the ticket office, tea room and snack barn. There is livestock on site so we do ask that you keep your dog on a short lead at all times, and with the exception of assistance dogs we ask that you do not take your dog inside any of the historic buildings. Please always clean up after your dog. 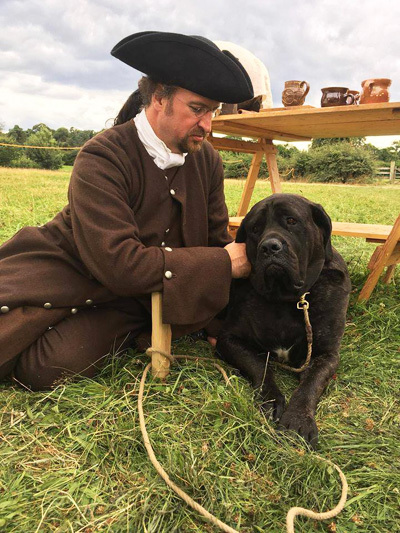 Some of our historical re-enactment events do have some gun fire which may scare some dogs so please check the events section of our website before you visit. Interesting dog fact: Matt Baker’s collie, Meg, who was a regular on the BBC’s Blue Peter during Matt’s tenure, learned how to be a sheepdog at Chiltern Open Air Museum. Matt also allowed the Museum’s sheep to graze on his land.